This is my new favorite crocheted hat this season. I love the two tones, which can be crocheted in any colors you like. One tester used a variegated yarn for the picot rounds and the other used a new color for each picot round. Both were awesome and it allows for lots of bright and cheerful colors to be packed into a single hat. Also it would make for a nice stashbuster, especially if changing colors for each picot round. 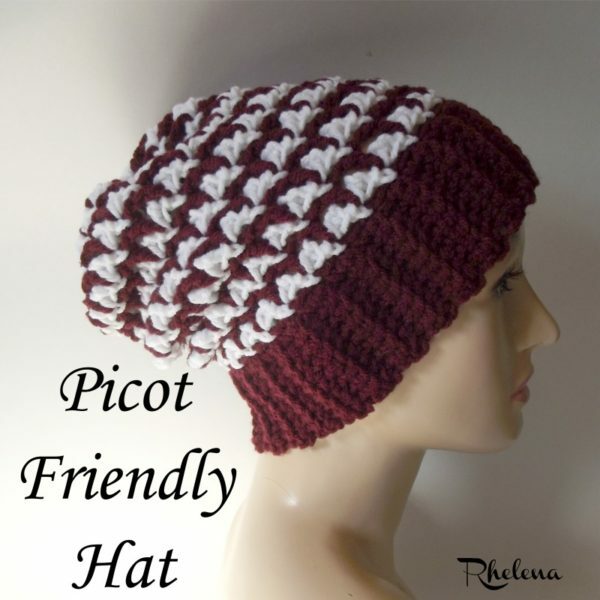 This hat can be crocheted to any size that you need it. You simply crochet the ribbing to the circumference needed, join, and begin working in rounds. And that means that you can basically use any yarn and hook size that you want as well. It’s great for babies to adults. And if you like this hat, you might also enjoy the picot friendly cowl to match. Or, check out this roundup of crochet winter hats. Gauge: 2″ over 3 stitch repeats. Finished Size: Lying flat it measures 9″ across by 10.5″ high. Can easily be increased or decreased to any size in multiples of 2. Rows 2-54: Ch 1, blsc in each sc across. Turn. (8 sts) Continue with this row until you have reached a desired circumference making sure to end in an even number of rows. Rnds 5-17: Rep rnds 3-4 ending rnd 17 with rnd 3 and omitting the color change at last round. Fasten off leaving a 8-10″ tail for weaving through the last rnd. I went into every dc and pulled tight to secure. Thank you so much to my testers for pulling through.